This is a small fresh antipasto salad suitable to begin Christmas lunch. It can also be used as a single dish for dinner in the following days when you want to give your stomach a rest and dispose of a few calories. The ingredients used are typical of December and from this it derives its name. The bitter taste of escarole is tempered by sweet raisins and orange. This salad is easy to prepare and you can already have it on the table when your guests arrive. Wash the escarole and dry well. Wash the endive and dry well. Use only the white part. 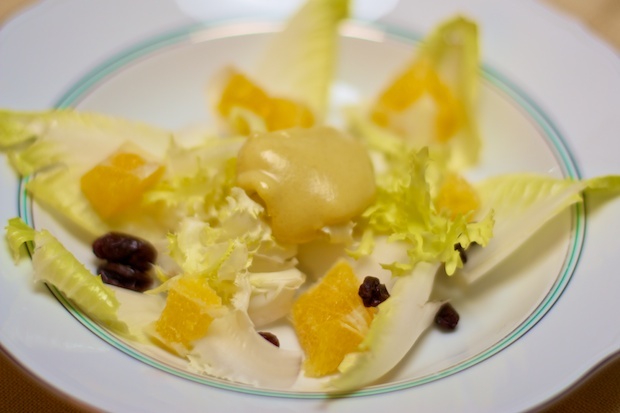 Arrange the escarole in the center of individual plates and place the belgian endive on top in a spiral. Cut the peel of orange including white skins. Cut the orange into four wheels, then cut the wheels into smaller pieces and add the pieces on top each salad. Wash the raisins and sprinkle them over each plate. Emulsify the oil with the dijon mustard. Divide the sauce, adding a small spoon of the sauce in the center of each plate. Posted in Appetizers, no category, Recipes, Salads. RSS 2.0 feed.